Built as a fortress in the 1200's by the Knights of the Teutonic Order. Sitting in the Carpathian mountains, known as Transylvania... modern day Romania. 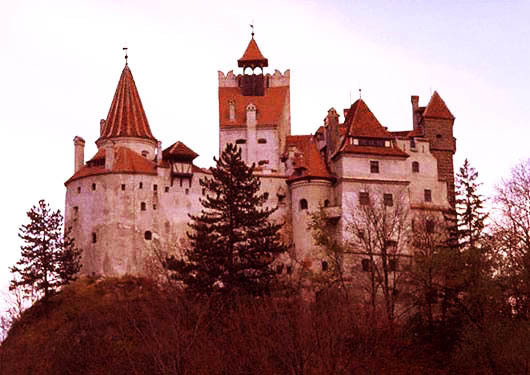 Temporary residence of Vlad Tepes, but its not the actual Castle Dracula even though many claim it is. The actual Castle Dracula is in ruins not too far away. Yeah, I know my vampire legends. Was fascinated by this stuff as a kid. Always wanted to go to Romania and see this place. The castle has been used in several movies. It was confiscated by the communist government of Romania in 1947. The dictator and his wife were overthrown in December 1989 in a violent revolution, and then tried by military court-martial, found guilty of genocide, and both were executed by firing squad on Christmas day. Three days from arrest to execution, I remember how much that shocked me back then. Last year the castle was given back to the rightful owner. I dont remember his name but he is a descendant of Queen Marie, who lived there in the early 1900's. How cool would it be to actually own this piece of midieval history? that would be cool as hell!!!! !